The top 24 places will make the money, with first place taking home $10,947. Marc Evanier raises to 300,000 on the button, and LJ Sande reraises to 900,000. Evanier pauses for a few moments before announcing that he is all in, and Sande quickly calls, having Evanier covered. Evanier turns over 8♥8♦, and Sande shows A♥Q♠. "Let's at least make this interesting," Evanier says. The A♦ appears in the window, but it's followed by the A♣ and the 8♦, giving Sande trip aces, but leaving Evanier in the lead with a full house. 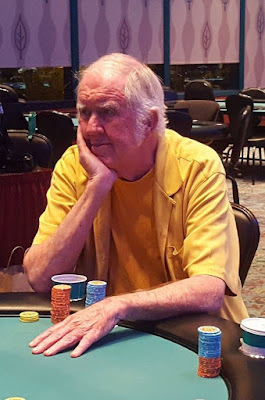 Evanier maintains the lead when the 7♥ comes on the turn, but the 7♠ on the river gives Sande a bigger full house to win the hand, and eliminate Evanier in 2nd place. 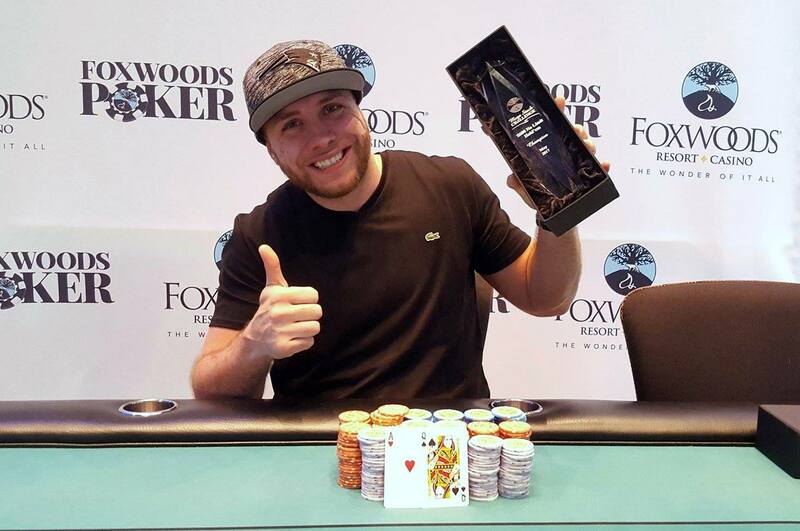 Sande is awarded the trophy, and $45,869, while Evenier takes home $43,432 for his second place finish. On a board reading K♠7♣4♣, Marc Evanier checks, LJ Sande bets 400,000, Evanier raises to 1,000,000, and Sande quickly shoves all in. 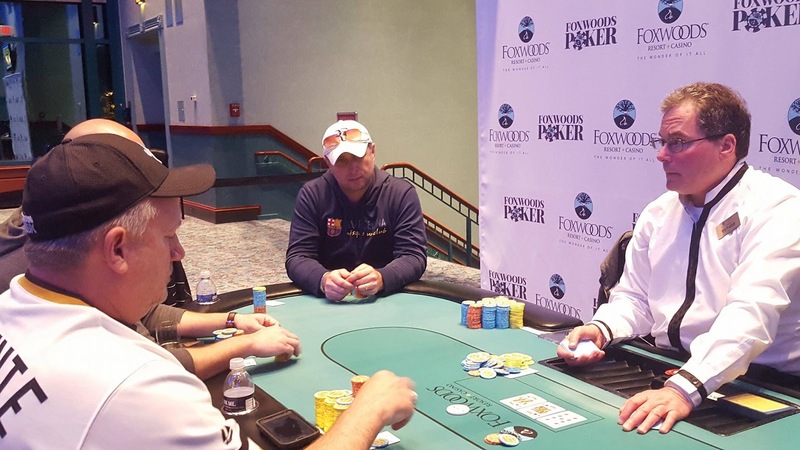 "You flop so good," Evanier says before tossing in a chip to call for his tournament life. Sande turns over K♥10♦, and Evanier shows Q♣2♣. "Ah you have a flush draw man, what do you mean I flop so good?" Sande asks Evenier. "I was just trying to make a move," Evenier says, but the turn is the A♣ comes on the turn bringing the flush for Evanier. The river is the 5♦, and Evenier doubles up. Marc Evanier pushes all in on a board reading A♣9♣5♠ and John Caputo calls. The 10♦ turn is safe for Caputo, but the K♥ on the river gives Evanier a bigger two pair to win the hand. After a close count of chips it's determined that Evanier has Caputo just slightly covered, and Caputo is eliminated in 3rd place. LJ Sande raises to 160,000 on the button, and Marc Evanier shoves all in from the big blind. Sande asks for a count and upon hearing the 1,010,000 he calls. The board runs out Q♠4♥2♦K♥7♠, awarding Evanier a double up. Marc Evanier raises to 200,000 in the cutoff, and Aaron Barham shoves all in from the big blind. Evanier asks for a count, and upon hearing the 1,200,000 total, Evanier calls. The board runs out Q♦6♣4♣8♠3♥, awarding Evanier the pot, and eliminating Barham in 4th place. 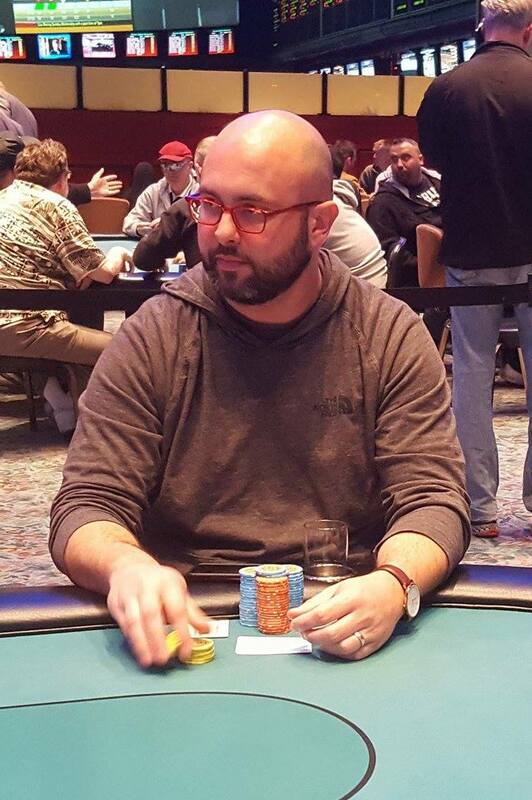 John Caputo raises to 250,000 on the button, and Aaron Barham shoves all in from the big blind. Caputo pauses for a few seconds and says, "Alright, let's do it." Caputo shows A♥5♥ and upon seeing Barham;s K♣10♥, Caputo says, "Keep it clean." The flop comes J♦10♣5♣, giving Barham the lead with a pair of tens. He maintains that lead when the tun comes the 2♥. The river is the 8♥, and Barham doubles up. Manny Okrah was just eliminated after shoving all in on a board reading 8♦4♠3♥4♥5♣. LJ Sande tanked for over a minute before tossing in a chip to call, and Okrah quickly said, "Nice call," as he turned over 10♦6♥. Sande showed 2♠2♦ to win the hand and eliminate Okrah in 5th place. 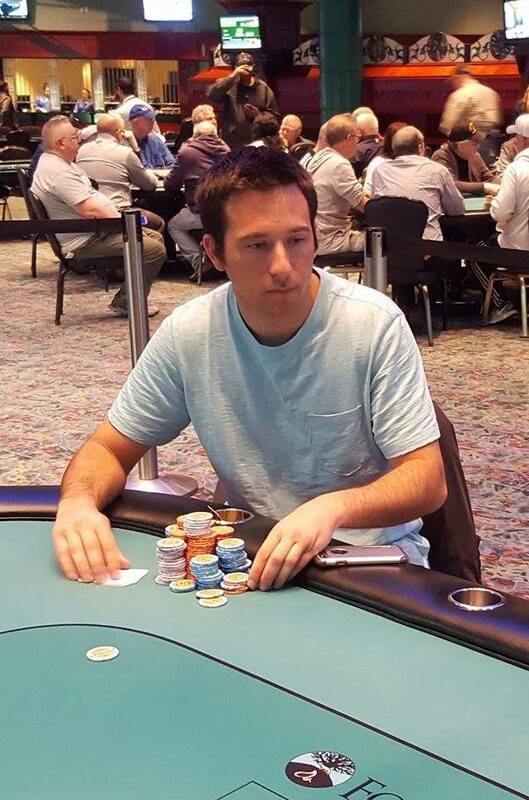 Dena Pearlman raises to 125,000 in middle position, and Aaron Barham calls in the big blind. The flop comes Q♠7♦5♣. Barham checks, Pearlman bets 250,000, and Barham calls. The turn is the K♠. Barham checks, and Pearlman announces that she is all in. Barham asks for a count and the dealer tells him it's 615,000 to call. Barham thinks for about ten seconds and then calls. "Good call," Pearlman says as she turns over 3♦3♥. Barham shows K♥J♠. "You floated me on the flop with king jack?" Pearlman asks Barham. Barham just shrugs his shoulders. 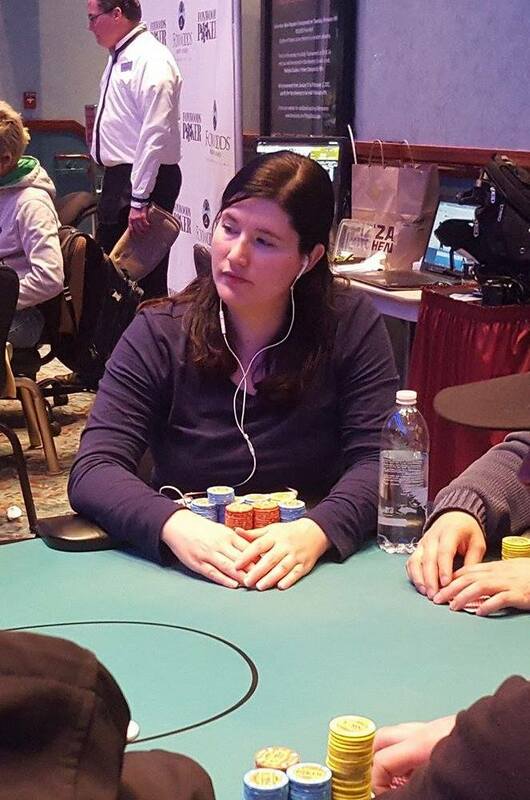 The 8♦ river does not improve Pearlman's hand and she is eliminated in 6th place. Action folds to Manny Okrah in the cutoff who shoves all in. Aaron Barham asks for a count on the button, and upon hearing the 1,115,000 total, Barham calls. LJ Sande folds his small blind, and Dena Pearlman asks Barham how much he started the hand with, as she stands up quickly from her seat. "About 2.6," Barham tells Pearlman, referring to his 2,600,000 stack to start the hand. Pearlman is visibly jarred, and starts pacing near her seat. She ultimately opts to fold her hand, and the two other players table their cards. "I was behind that," Pearlman says as she points to Okrah's pocket queens. The flop comes J♦7♦2♠, and Pearlman says, "There went my tournament, I had pocket sevens." The 5♥ turn and 5♠ river are safe for Okrah, and he doubles up. "So frustrating," Pearlman says, "But I cant really call half my stack with sevens there." Marc Evanier raises to 105,000 on the button, and Manny Okrah reraises to 450,000 in the small blind. Evanier pauses for a few seconds before calling the raise. The flop comes K♠9♦7♦.Okrah bets out 400,000, and Evanier announces that he is all in. Okrah asks for a count, and upon hearing the 965,000 total, he calls. "Very nice play," Okrah says to his opponent. The 2♦ turn and J♣ river are safe for Evenier, and he doubles up. Dena Pearlman raises to 100,000 on the button, and Marc Evanier shoves all in from the big blind. Pearlman asks for a count and the dealer tells her it's 985,000 total to call. "I dont think I am good enough to fold this," Pearlman says, "I have an ace." About a minute and a half passes by and Pearlman says, "I call." The A♣ appears in the window causing Evanier to say, "Right in the window." But it's followed by the 7♣ giving him a set, (and the 5♥) causing him to say, "Yessss!" The turn is the 2♣, and the river is the 5♦ giving Evanier a full house to double up. After ten full levels of play, the final seven players are now bagging up their chips for the night, and will return to play Day 3 tomorrow at 12:00 noon. The chip lead at the end of the night is within 40,000 chips. Aaron Barham bagged up 3,280,000, and Dena Pearlman ended with 3,240,000. Pearlman won a monster pot in the second to last level of the night when she doubled through Manny Okrah and became the first played to cross the 3 million chip mark. Pearlman and Barham took turns taking the lead from each other as the final table played out in the last level of the night. LJ Sande flew somewhat under the radar throughout the day, but towards the end of the night, he won a key pot and took the chip lead after eliminating Zhi Wu in 15th place, and Steven Fiorentini in 14th place. 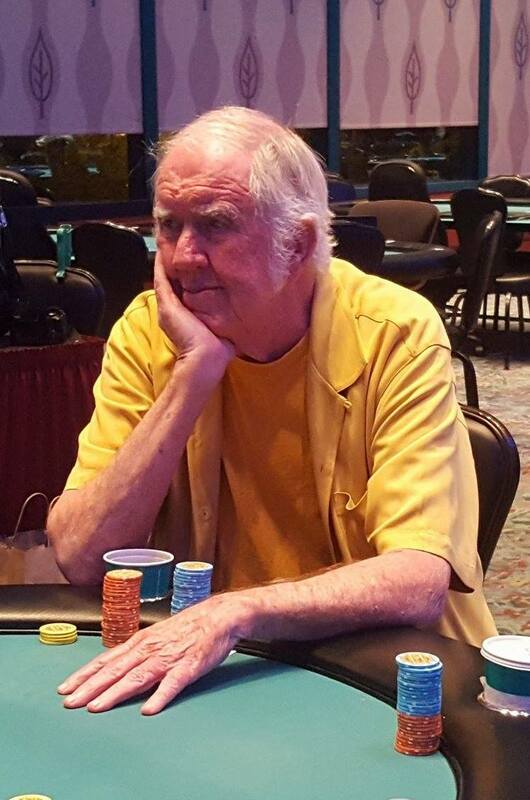 LJ will come into Day 3 third in chips with 3,105,000. 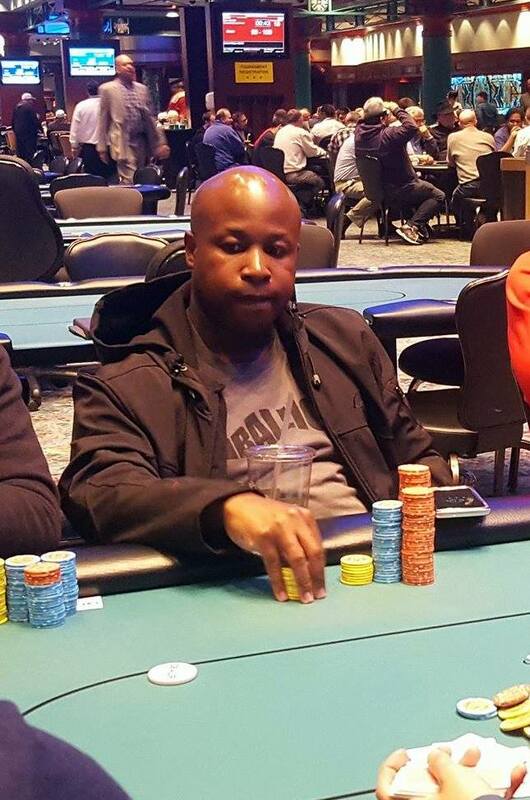 Manny Okrah held the chip lead for the majority of the day, and was the first player to cross the 1 million chip mark, and the first player to cross over the 2 million chip mark as well. Okrah ended today with 1,545,000, good for fifth in chips coming into Day 3. Play will resume at 12:00 noon on Wed. May 10th, at Level 27 with 20,000/40,000 blinds and a 5,000 ante. The average chip stack heading into Day 3 is 2,217,142. Here is a look at the final seven players heading into tomorrow's final Day 3. Each of them is guaranteed at least $11,370, but all have their eyes set on the $72,361 first place prize. Thomas Dragone is all in holding K♣Q♣, and has been called by LJ Sande holding A♣A♦. The flop comes 5♦5♣3♣, and Sande says, "It's never easy is it?" The 4♠ turn and Q♥ river are safe for Sande, and Dragone is eliminated in 8th place, taking home $9,175.